My friend Alice from NUA and myself, have been invited to create some live visuals and animation for Spectro @ Norwich Arts Centre on the 15th November. Spectro is an electronic dance night so I am really looking forward to creating some live visuals. We have decided to project onto around 4 or 5 spheres which will be hanging from the roof above the audience and project onto them. 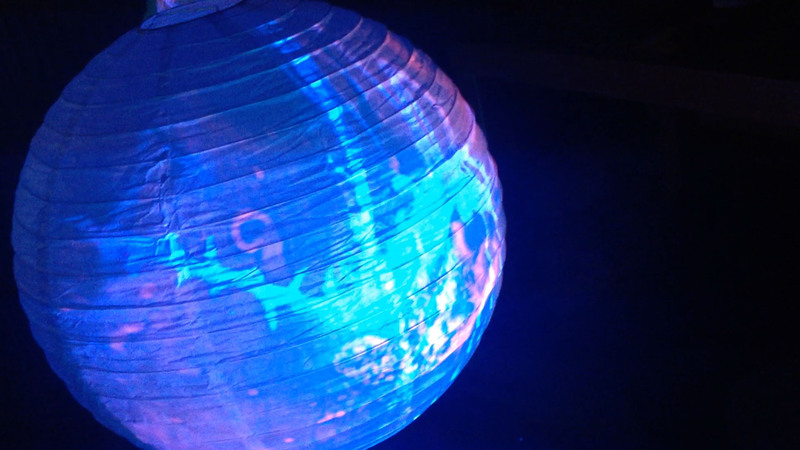 In my last project I used a polystyrene sphere, which was perfect for projecting onto, although to purchase 4 or 5 of these would be very expensive. Alice suggested paper or Chinese lanterns as a cheaper alternative. I spent a fair old while trekking round shops to find something that was: white, inexpensive and relatively large. I thought this would be easy, but I was very wrong. Finally I discovered that Wilkinson’s (a home goods store) sells them for about £4.50 each, white and they are 20″ in diameter, which I hope will be large enough for the venue. The video above was shot in my front room, in very limited time (as you can tell from the dog in the first shot!). It was just to test out a number of potential difficulties e.g multiple spheres, will it actually look good and does it work? I’m quite happy with the results and hopefully when it’s setup in the venue it will look great. We will be performing on: Friday 15th November 2013, Norwich Arts Centre @ Spectro, alongside Mount Kimbie!